- Kleine Dada Soirée: 16 digital C-prints, framed, 35 x 35 cm [13 3/4 x 13 3/4 in.] each. - Gáz Szív: 8 digital C-prints, framed, 31 x 23 cm [12 1/4 x 9 in.] each. - 1919/1930: digital C-print, 35 x 40 cm [25 1/2 x 15 3/4 in.]. - 1930/1919: digital C-print, 235 x 40 cm [25 1/2 x 15 3/4 in.]. - L.H.O.O.Q./Fountain: gelatin silver fiber-based print, mat and frame, 37 x 53.2 cm [26 3/8 x 22 1/8 in.]. - Richard: digital C-print mounted on aluminum, 116 x 110 cm [45 5/8 x 43 3/8 in.]. 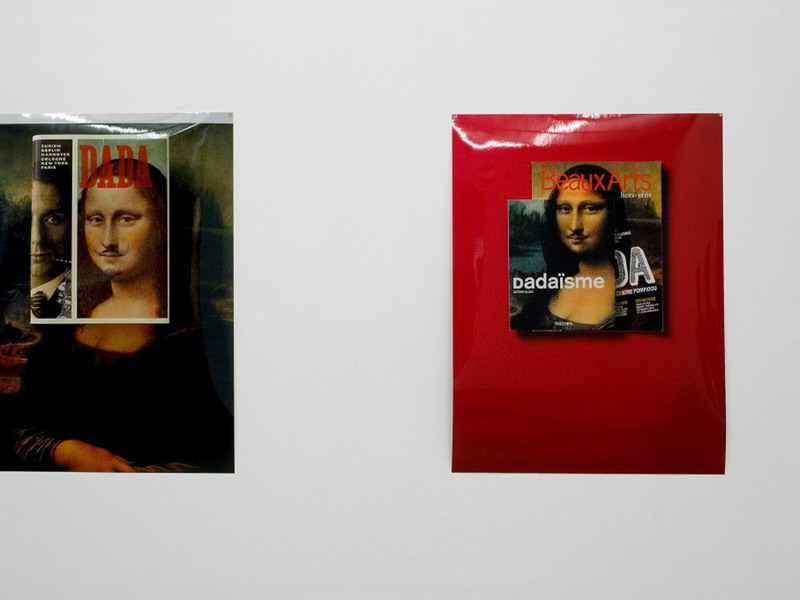 “Richard/Dada” consisted of photographs of publicity products. All of the photographs in this show were printed to present objects life-size. In the gallery were pictures of publicity products made for the “Dada” exhibition, which ended at the nearby Centre Pompidou just as this show opened. 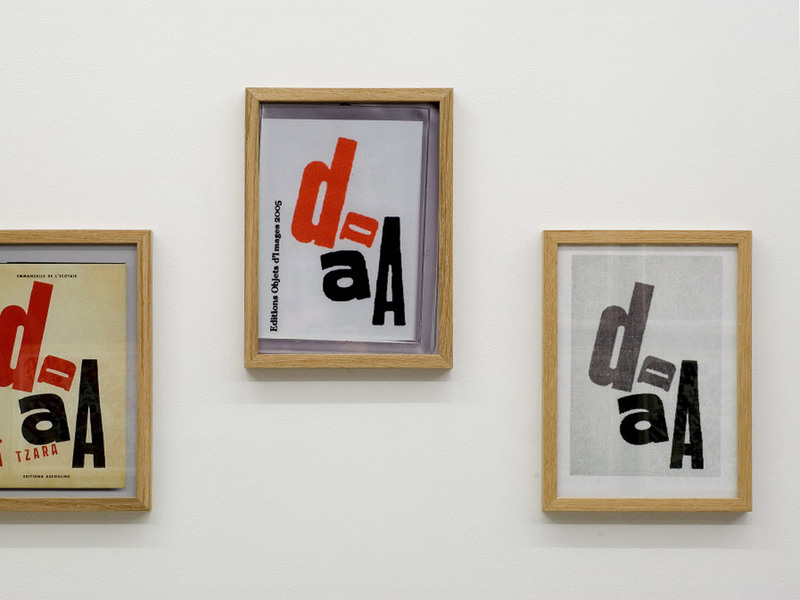 Reproductions of three icons of Dada were particularly recurrent in souvenirs and publications: the flyer Kleine Dada Soirée (1923), by Kurt Schwitters and Theo van Doesburg; Lajos Kassák’s cover design for Tristan Tzara’s book Gáz szív (1922); and Marcel Duchamp’s L.H.O.O.Q. (1919–1930). For L.H.O.O.Q., the publications depicted in the photograph were printed life-size. For the Kleine Dada Soirée and Gáz szív, however, my photographic prints enlarged or reduced the reproductions depicted in order to match the dimensions of the original works and documents. 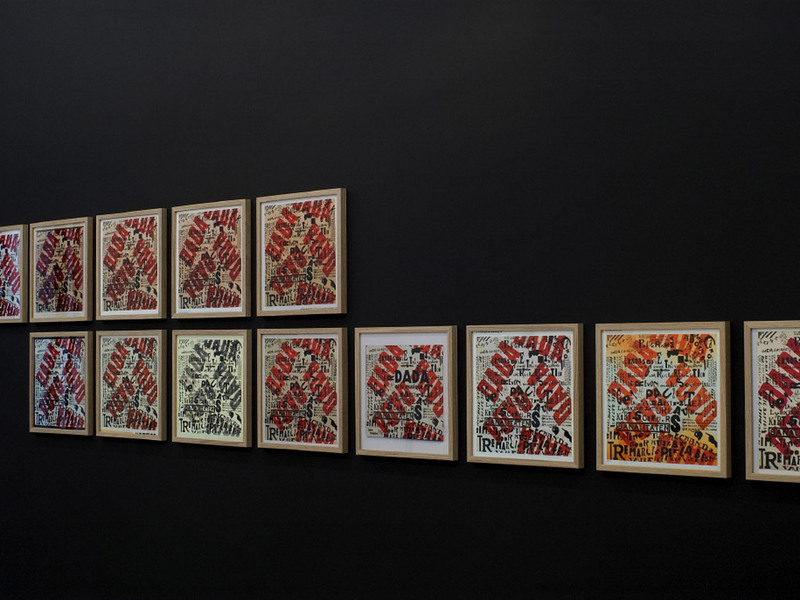 Presenting similar images side by side and at the same scale, what the viewer is given to see in these two series are variations in color and printing process in the reproduction of these works. 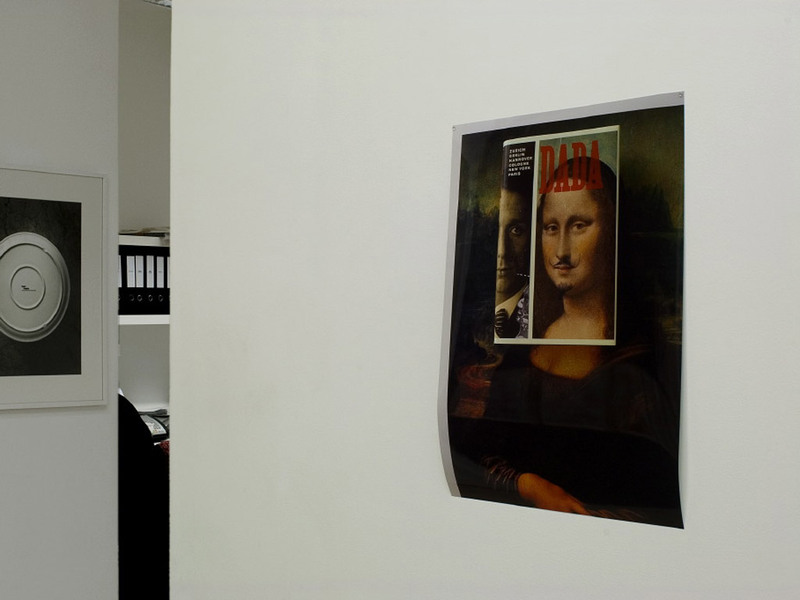 In the office was a large photograph dedicated to Richard Hamilton, commonly known as the father of Pop art and for his interest in Dada. Reconstituted in the gallery, the composition is from a photograph documenting Richard Hamilton’s Sign, Carafe, and Ashtray (date? 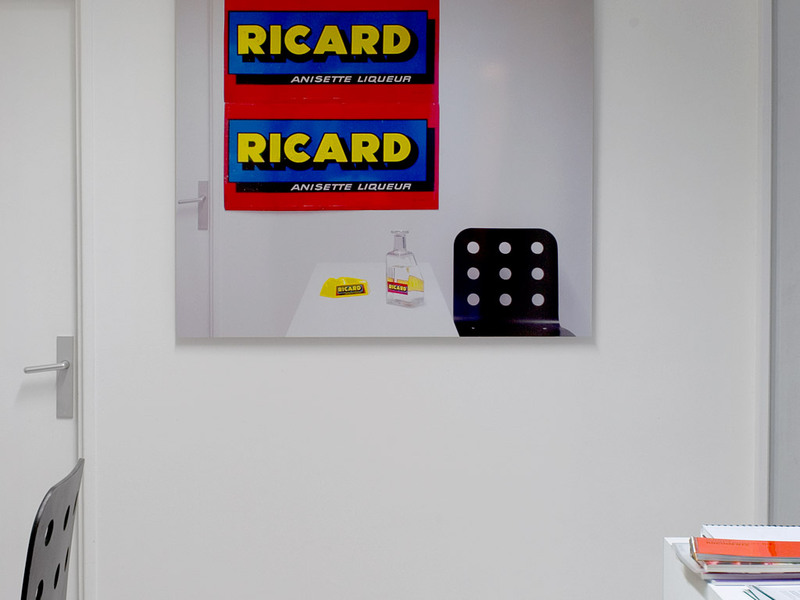 ), in which he appropriated publicity products made for the Ricard brand—which, at the time of this exhibition, was frequently present at contemporary art openings in France, in the form of free drinks. The carafe in the foreground is shown in actual size. 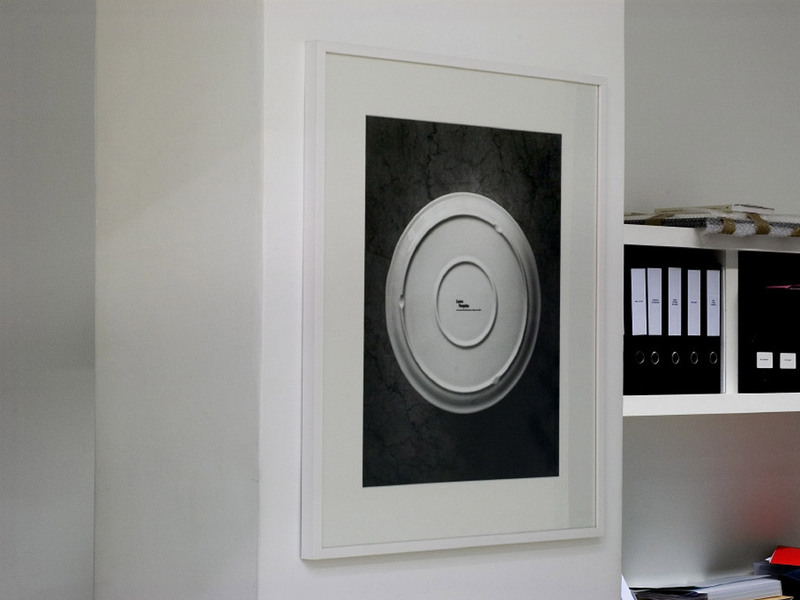 Between the gallery and the office hung a picture of the underside of a a ceramic cheese plate sporting the letters L.H.O.O.Q., photographed in the style of Stieglitz’s photograph of Duchamp’s urinal signed R. (Richard) Mutt.